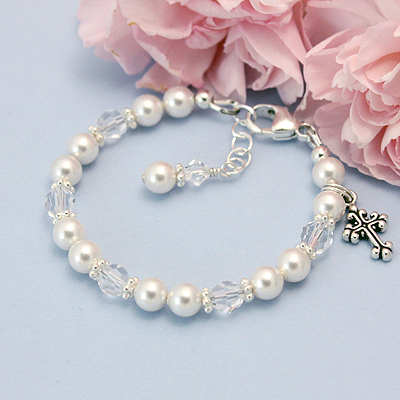 Choose a special Baptism baby bracelet for a little girl or little boy. 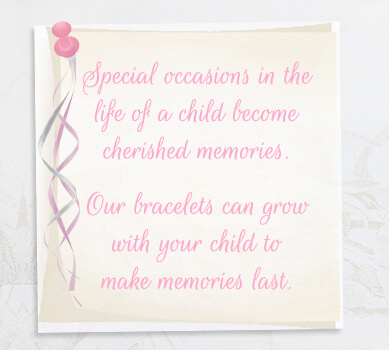 Our Christening baby bracelets and baby dedication gifts will make the occasion special. 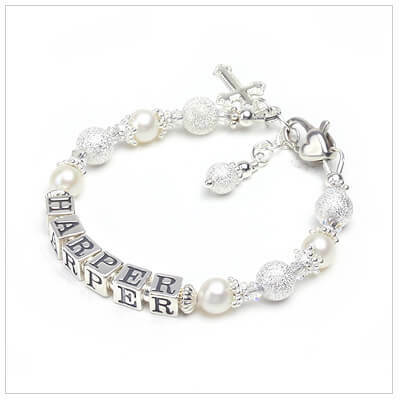 Beautiful white pearl bracelets for little girls with custom engraving. Quality jewelry that is irresistible! 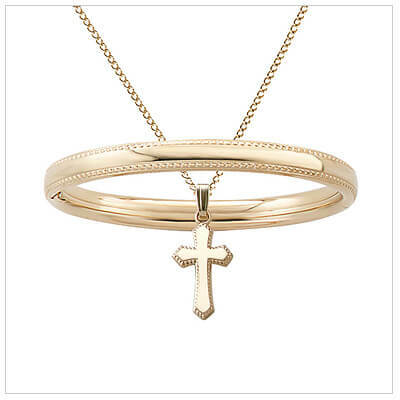 Baptism jewelry set in 14t gold filled includes a bangle bracelet and Cross necklace. Baptism gifts. Jewelry set of silver bangle bracelet and matching Cross necklace. Baptism Gifts. 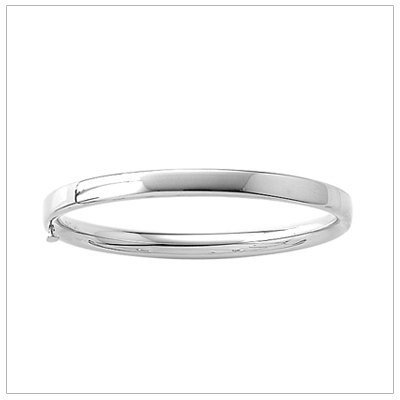 Bangle 5.25 in. 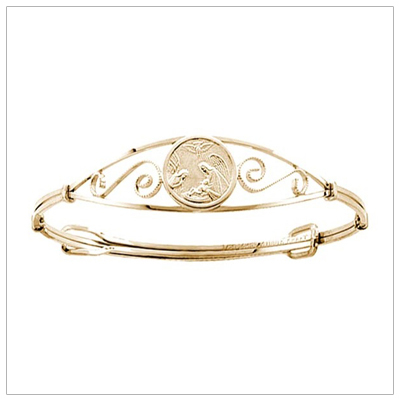 14kt gold filled bangle bracelet with a guardian angel. Adjustable size to fit toddlers and children. Guardian angel bangle bracelets in sterling silver. Adjustable sizing fits baby, toddler, and child. 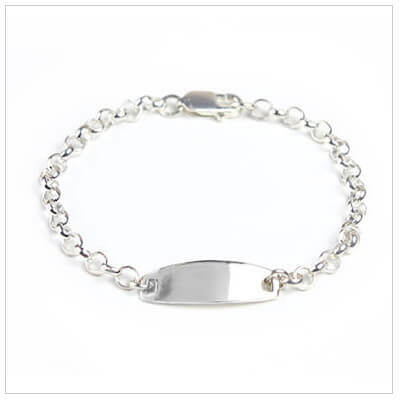 Handsome boys Baptism bracelet in sterling silver. 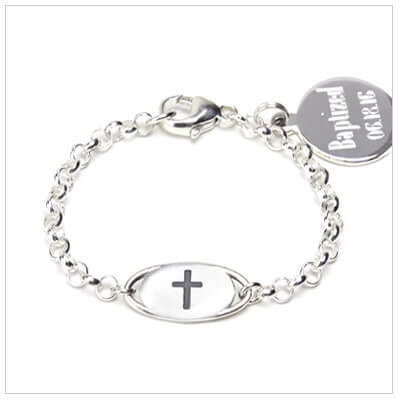 Add engraved charm to personalize with a name. 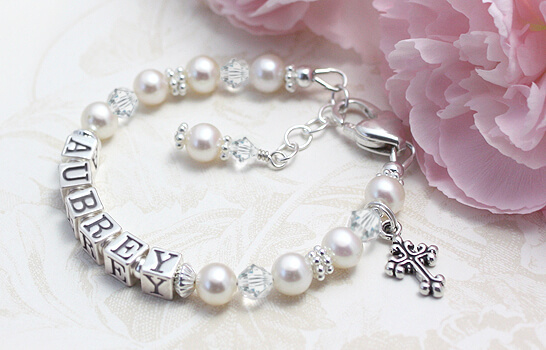 Baptism bracelets in pearls and shimmery stardust beads, Cross charm included. 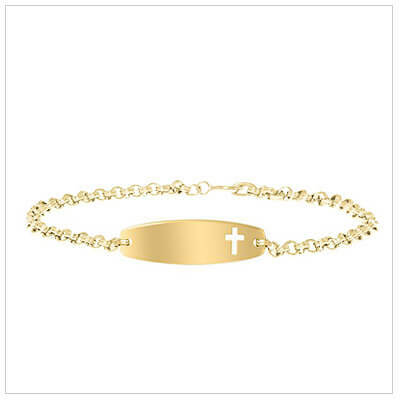 Baptism jewelry. 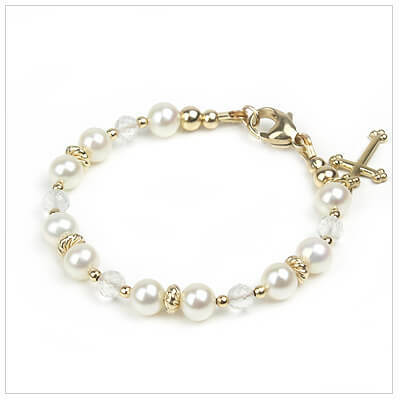 Cultured pearl baby bracelet with smooth rounded Cross bead; perfect infant Baptism bracelet. 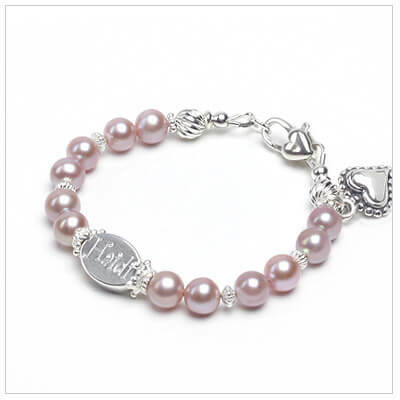 Cultured pearls smooth Cross bead, and pink crystal-set sterling. Perfect for babies. 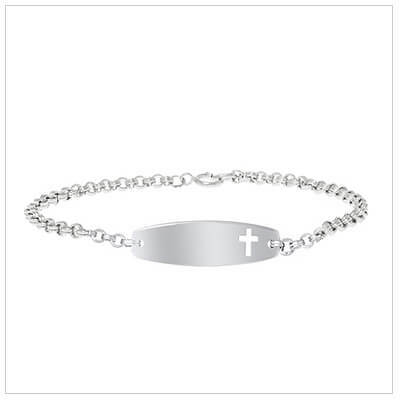 Customer favorite!Baptism bracelet for girls with beautiful designer sterling beads, Cross included. 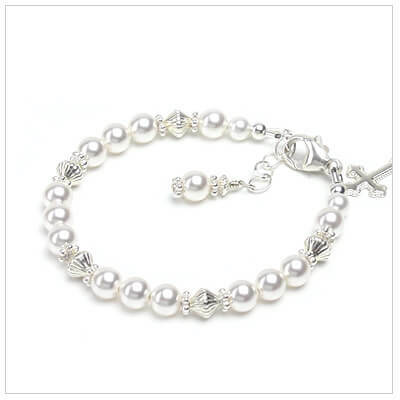 Swarovski pearls and clear sparkling crystal on a dainty pearl bracelet. 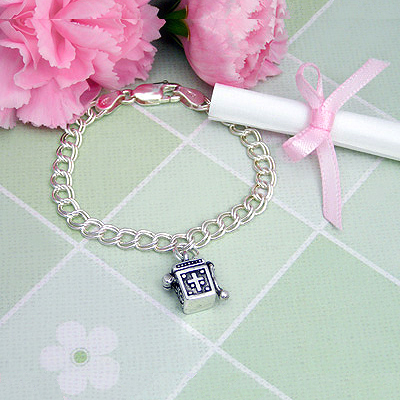 Charm included. 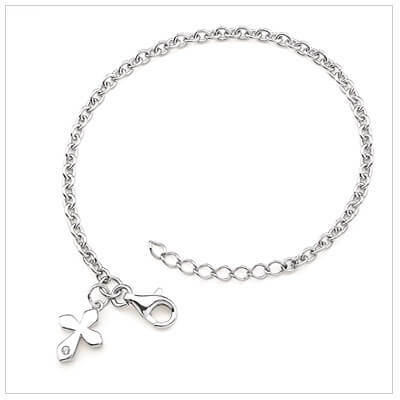 Girls charm bracelets in sterling silver with a beautifully shaped diamond Cross. Adjustable size.